Mexico in 2018 accounted for more than a quarter of General Motors' estimated North American production for the first time, a proportion that will rise further if the company follows through with plans to end production at five plants in the United States and Canada this year. 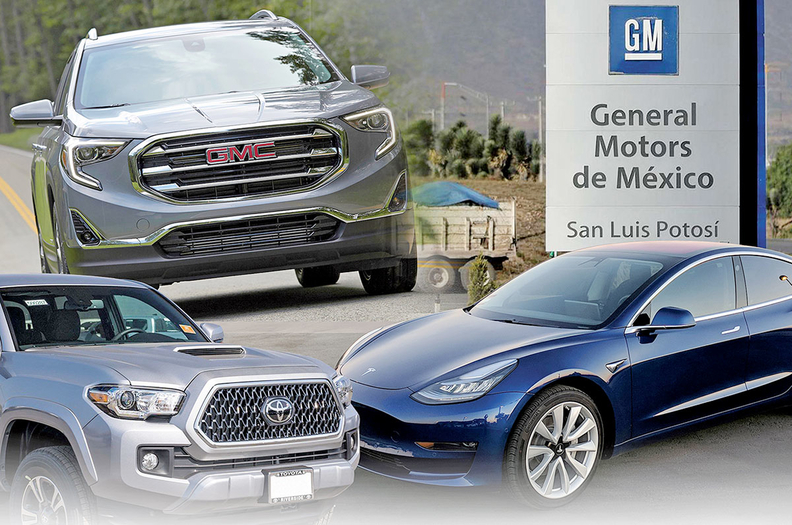 GM is now Mexico's largest auto producer, topping Nissan Motor Co. in a year when it reduced output by an estimated five per cent in the United States and an estimated 33 per cent in Canada, according to the Automotive News Data Center. GM built 834,414 vehicles in Mexico last year, an increase of 3.6 per cent, vs. a 10 per cent decrease to an estimated 763,257 for Nissan, which had been No. 1. Overall production in Mexico fell by one per cent in 2018. That's the first time Mexico production has declined since automakers began opening a flurry of plants south of the U.S. border to take advantage of lower costs from nonunion labor and favourable trade agreements with overseas markets. But production in Mexico is expected to remain stable in the coming years, particularly now that the U.S., Canada and Mexico have signed a renegotiated free-trade agreement, said Eric Anderson, a senior analyst with IHS Markit. GM imports 36000 vehicles from Mexico to Canada annually. The automaker also says the company only imports three vehicle models from Mexico out of 47 it sells in Canada. Total North American production declined for a second consecutive year. Production was down an estimated 2.6 per cent overall, including an estimated two per cent in the United States and an estimated 8.8 per cent in Canada. Just three automakers built more vehicles in the U.S. in 2018: Tesla, up 151 per cent; Volkswagen Group, up an estimated 22 per cent; and Honda Motor Co., up 2.7 per cent. Ford remained the largest U.S. producer, building nearly 2.4 million vehicles domestically vs. about 2.1 million for GM. In Mexico, Toyota Motor Corp. built 49 per cent more Tacoma pickups in Tijuana, and Hyundai-Kia made 33 per cent more small cars in Nuevo Leon. Besides those two and GM, the only other automaker to raise output in Mexico was Fiat Chrysler Automobiles — by 369 vehicles. Honda and Ford joined Nissan with double-digit cutbacks. A GM spokesman said the company hasn't added any capacity in Mexico for a decade and has no plans to do so. Its 2018 gain there stemmed from falling demand for GM's U.S.-made cars and surging popularity of crossovers such as the Mexico-made GMC Terrain and the Chevrolet Equinox, which is built in both Mexico and Canada. Production of the Equinox and Terrain in Mexico nearly doubled from 2017, but GM built 11 per cent fewer pickups and 74 per cent fewer cars in Mexico last year.Mexico represented an estimated 30.8 per cent of GM's 2018 light-truck production and an estimated 25.7 per cent of its total output in North America. Ford got 9.7 per cent of its North American supply from Mexico but doesn't build any pickups, SUVs or crossovers there. The decision to make the Blazer in Mexico — reached, company officials say, when sedan sales were higher and GM had less U.S. capacity to spare — has been a particularly sore spot for Unifor and the UAW, which learned of it on the day GM reduced its Chevy Cruze plant in Lordstown, Ohio, to one daily shift. GM says it will end production in Lordstown after March 1, followed later in the year by assembly plants in Detroit and Oshawa, Ont., and propulsion plants in Michigan and Maryland. Unifor proposed the Blazer be assembled in Oshawa as a way to save the plant there. Unifor last week blocked access to the headquarters of GM Canada in protest of the potential plant closure.